ANVCA promotes the success of our Village Corporations and protection of our Native lands. 2017 has been an amazing year of transition for the Alaska Native Village Corporation Association. We have moved our offices to downtown Anchorage, so we are no longer housed within The Kuskokwim Corporation. This change will allow ANVCA to become a fully independent organization but has also left us more reliant than ever on getting support from our members and partners. I am happy to report that we are gaining traction already and have welcomed back former members as well as new dues paying Village Corporations to our roster! In addition, we have forged new partnerships with the Alaska Business community to ensure that ANVCA provides economic opportunity for its members. We will be working with our partner organizations in the coming months to develop our "members only" section of the website, where you will find tools and templates for you to use within your organizations on a wide variety of topics. These tools will be a benefit for our dues paying members only. Our partner community also includes various merger and acquisition entities who will be able to network various Alaska active operating businesses that may be available for purchase. I have been honored to serve you all in the past 7 months in the capacity as Executive Director, my background and experience and extensive contact list should bring continued value to the organization, but not so much as our two new staff members! We are excited to have Billie Christiansen of Old Harbor and David Clark of Tatitlek join the organization on a part-time basis in 2017 while we get on our feet, we hope to bring them on full-time in the near future! Both David and Billie bring the right attitude and energy to work every single day, ANVCA is lucky to have found them. We are excited to share with you the many goings on here at ANVCA! We will begin to update you via a quarterly newsletter beginning in 2018, however here is a bi-annual update for 2017, please make sure to check for upcoming opportunities to participate in ANVCA, we will be reaching out to all of you for future events! ANVCA has over 50 other targeted meetings with various agencies and individuals in the works. These meetings will be focused on our 2017 legislative priorities (below). ANVCA coordinates lobbying teams, provides advanced advocacy training, prepares talking points and schedules high level meetings. Participants will join small groups to lobby on specific issues with a team leader. This year, ANVCA will be Co-Hosting a reception with the National Congress of American Indians, Native American Contractors Association, National Center for American Indian Enterprise Development, and the Alaska Federation of Natives in the afternoon of September 12. We anticipate as many as 200 tribal leaders as well as 20-30 Alaska Native Village Corporation representatives in attendance! Advocate for an annual report that follows the clean up of contaminated lands. Advocate for construction of the King Cove to Cold Bay road; Refuge Act. Members and Partners are invited to participate in planning and traveling with the ANVCA team. Village Corporations and Partners are responsible to make to their own travel arrangements. The legislative fly in host hotel is the Capital Liaison Hotel in DC. This rate is only available until August 21. Exact itineraries will be provided one week prior to travel, we will also hold an advocacy training session to prepare any new advocates for this important journey to DC. All paid and affiliate members are welcome to join, we also invite our partners to join us! click on the link below to register or RSVP today! A s a follow-up to the Strategy Foundations presentation at the ANVCA Conference this year, Erin Sedor is back to offer a deeper dive into Essential Strategy, a simplified yet holistic approach to strategy, risk and sustainability. 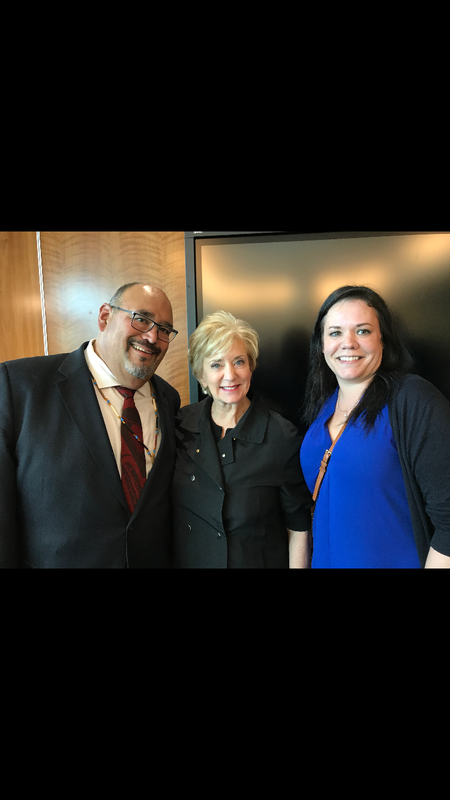 Erin is a life-long Alaskan and has built a 25-year career working for dynamic organizations in the 49th State, including Alaska Native Corporations with operations spanning the entire US and abroad. She understands the challenges faced by ANCs, and her unique approach connects these critical programs in a way that is logical, efficient and improves operational execution and goal achievement. She will change the way you think about strategy execution! 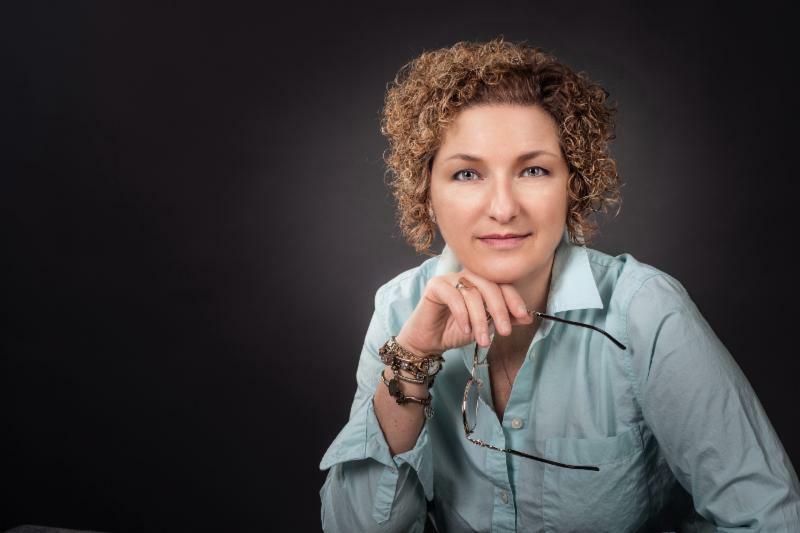 Erin Sedor is the founder of Black Fox Strategy, a highly specialized executive consulting practice based on the philosophy that organizational success and sustainability are best achieved through integrated strategy, risk and resilience capabilities. She helps companies improve both design and execution of their business strategy by creating a balanced focus on growth, survival and purpose. Erin holds a Master Degree in Operational Risk, Bachelor degrees in both Finance and Organizational Management, a Professional Certification in Paralegal Studies, and a RIMS Fellow Professional designation. 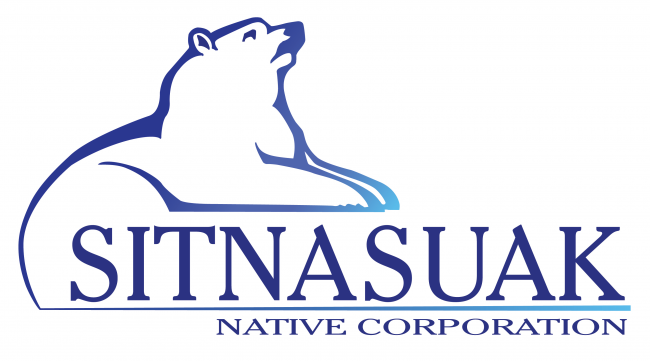 Sitnasuak Native Corporation is one of the Alaska Native village corporations and proudly headquartered in Sitnasuak or Nome. As we enter 2017, Sitnasuak is strategically growing and sharing our businesses with customers, shareholders and employees. As background, the Corporation has developed a diversified portfolio of businesses in Nome, Anchorage, Wasilla, California, Virginia and Puerto Rico. Sitnasuak’s family of companies and brands include Bonanza Fuel, Bonanza Express, Fidelity Title, Mat-Su Title, Nanuaq, Mocean, SNC Technical Services, and Sitnasuak Construction Services. Our products and services range from fuel delivery services and commercial space rentals based in Nome, to residential and commercial title insurance and escrow services based in Anchorage and Wasilla. We are blessed with dedicated employees, board members and shareholders to advance a strong community with economic development that honors our heritage, lands and resources. Our operations in 2016 produced revenues of $130 million that supported shareholder employment opportunities, dividends, scholarships and donations to community organizations. Our connection to our values, employees and customers sustain our Corporation to earn resources for our future. Key values that define Sitnasuak’s business culture are: integrity, transparency, hard work, respect for all our stakeholders, and a powerful commitment to attract and develop the best people. Working together, we can continue sharing our success with our community and shareholders across Alaska and the globe. For additional information on Sitnasuak and our business products and services, please visit our web site at www.snc.org or like our Facebook page www.facebook.com/Sitnasuak/. We are looking forward to thriving businesses and culture for many years to come. 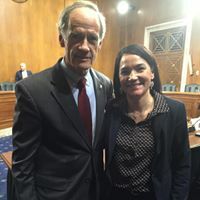 ANVCA was invited to testify in front of the Senate Environment and Public Works Committee in March of 2017 regarding ANCSA Contaminated lands. Afognak Board member and ANVCA member Sarah Lukin took the lead on drafting official comments and also in testifying before the committee. ANVCA has been tracking and collectively advocating on this issue since 2012, we have been successful in gaining traction in the past 3-years in large part due to our membership efforts in DC. In fact, following our testimony in March, ANVCA worked with Senator Sullivan's office to draft amendments to the Comprehensive Environmental Response, Compensation, and Liability Act (CERCLA) that will lift the legal liability for ANCSA Corporations that received this land. The Senate Environment and Public Works Committee approved via voice vote the Brownfields Utilization, Investment, and Local Development Act of 2017 (S. 822). The amendment to the bill would change the liability qualifications for parties responsible for the cleanup of Alaska properties and those interested in buying and redeveloping brownfields. We are encouraged by these amendments and will be focused on pushing for advancement of this legislation to the Senate floor as well as companion language in the House on our upcoming September fly-in. ANVCA would like to take this opportunity to thank Ms. Lukin and Afognak for their continued commitment to bring a meaningful resolution to this issue. 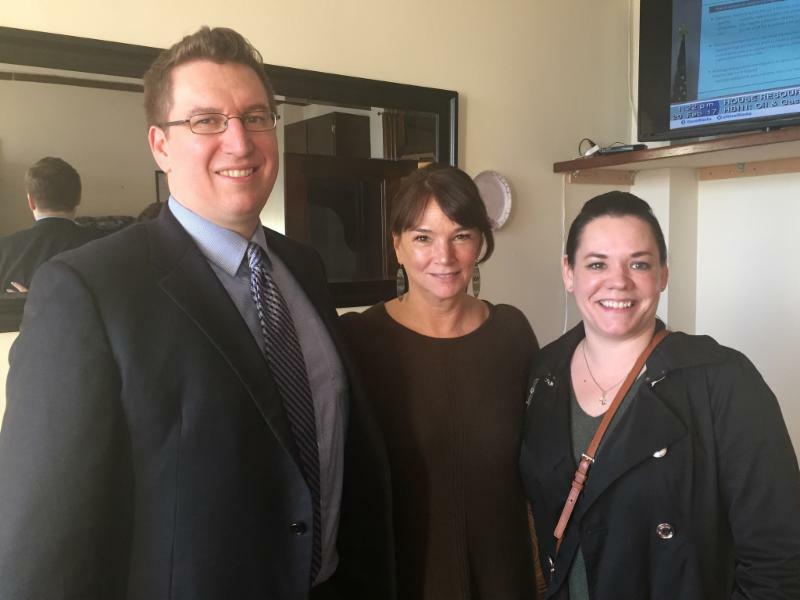 We also thank Brennan Cain of Eyak Corporation for his continued efforts on this issue, we are so very grateful to have you! ANVCA also sends a huge THANK YOU! to Senator Sullivan and his team for providing forward movement on this issue. We are grateful to have such an outstanding Alaska Delegation to work with. This thank you is of course further extended to the continued efforts of Senator Murkowski and Congressman Don Young as they have been instrumental in working with ANVCA to find a path to something better for our people than old contaminated sites that create liability instead of economic opportunity. Strategy is commonly defined as a plan of action designed to achieve a set of goals or objectives for a company. However, strategy that leaves out risk may end up being overly optimistic and result in problems that management did not anticipate. One issue is that strategic planning and risk management activities happen at different levels of the organization, and are not always interconnected. Traditional risk management is a function that focuses on hazard risks – safety, property damage, injuries, insurance, etc. The kind of risk management we need as part of strategic planning is a little different. Strategic risk looks across the company to identify and manage those risks that pose a threat to its mission and goals. For instance, let’s say that Company A suffered a fire at one of its many storage facilities resulting in a small loss of inventory that is fully covered by insurance. While it suffers the loss of some inventory, this scenario is not likely to result in the company failing to meet its revenue goals for the year (its mission). Now, let’s say Company B also had a fire at one of its storage facilities, but this time it held 90% of Company B’s inventory, and it was only insured for half the cost of the inventory. This is a completely different situation! Company A lost some inventory, but it keeps chugging right along. However, with most of its inventory gone and not enough insurance proceeds to replace it, Company B is in trouble. This is a strategic risk because Company B’s mission and goals are now in jeopardy. While this is a very simple example (real life is always more complicated), you can see the importance of identifying strategic risk. So how do we scan for strategic risk and incorporate the process into strategic planning? We look at the company’s goals and objectives, identify what events could prevent it from meeting those goals, and then develop a plan to mitigate the risks. Periodic meetings involving key staff is a good start to making sure staff is thinking about risk and communicating with top management. While uncontrolled risk assessments can run down any number of rabbit holes, the key here is to focus primarily on those things that will prevent the organization’s ultimate success. The other risks identified still need to be managed, but for strategic planning purposes, the risks to the company’s mission-critical goals will be front and center. ANVCA had a board vacancy recently that was created when former President and CEO of Tatilek Martin Hanofee left the company. ANVCA bylaws state that the Board shall appoint a member to fulfill the remaining term in the event of a vacancy. After sending out notice to our Village members to collect letters of interest for its July Board meeting, the ANVCA board voted unanimously to appoint Anne Thomas, President of the Chitina Native Corporation, the only Village Corporation in the Ahtna Region. Anne is one of the founding members of ANVCA, we are absolutely thrilled she is willing to rejoin the board to fill this vacancy, please help us welcome back Anne! "I have served on the Chitina Native Corporation Board of Directors for the past 18 years and served as President for most of that time. I have served on the ANVCA Board for Directors since its inception. ANVCA continues to work on issues to advance Native Village Corporations and protect their futures in the Alaska business and private sectors." Photo by Ukallaysaaq. 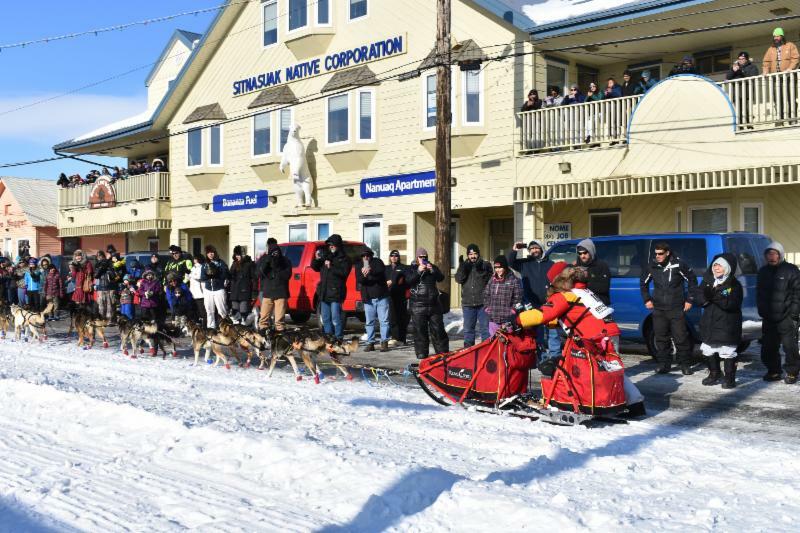 2017 Iditarod Winner Mitch Seavey finishing in downtown Nome in front of the Sitnasuak Headquarters and Offices. ANVCA traveled to Juneau in early 2017 to Advocate for changes to Alaska State Law surrounding ANCSA Contaminated Lands. Currently ANCSA Corporations are liable for clean-up of land they received under the Alaska Native Claims Settlement Act. ANVCA is working to draft language to amend State Laws that are specific to this issue to ensure that liability remains with the Federal or State Agency that caused the contamination. 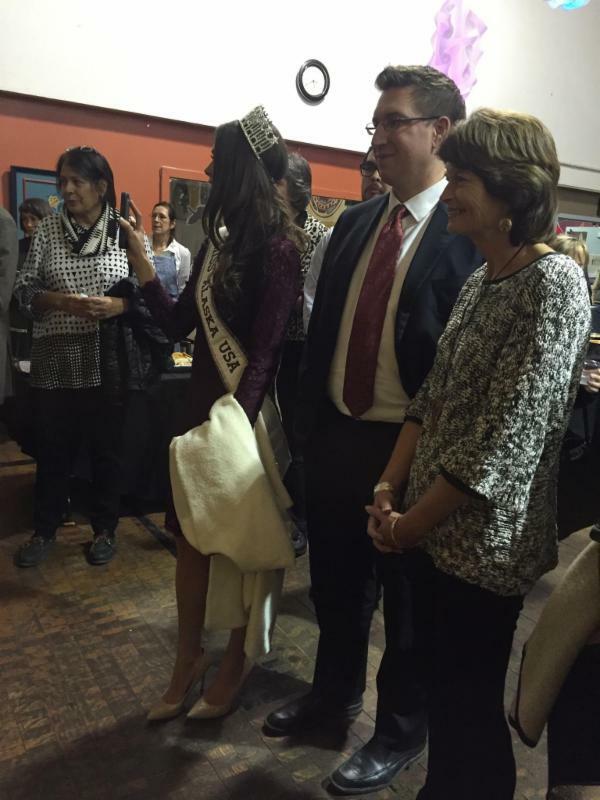 In addition, ANVCA Co-hosted a reception with AFN with special guests Governor Bill Walker, Lt. Governor Byron Mallott, and U.S. 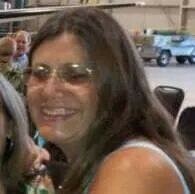 Senator Lisa Murkowksi. 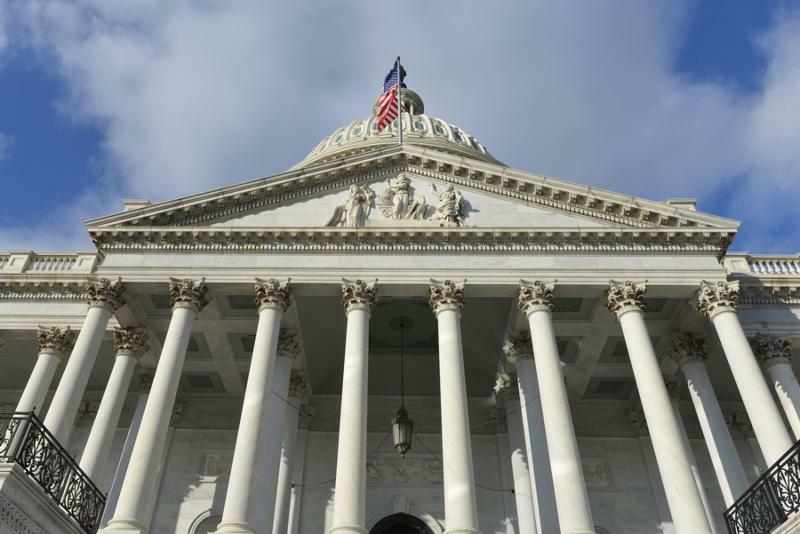 Before heading to recess, the Senate Small Business Committee (SSBC) approved six bipartisan bills unanimously. Now it passes out of the SSBC. The R&D credit was passed but many were unaware of its existence. This bill requires the SBA to create a program with the IRS to educate and train owners of small businesses and innovative start-ups about the availability of the tax credit. In our last regularly scheduled board meeting, ANVCA adopted a new level of membership. After having many conversations with our affiliate members, it became clear to us that our currently membership structure did not allow for full participation amongst our members. It is extremely important that our organization does better on gaining dues-paying members within the Village Corporations we represent. Having full dues-paying representation within our organization showcases our strength and unity and significantly strengthens our collective voice when talking with Public Policy influencers. Please read below for how to become a full member today! Review the different options for Membership and determine your level of support for ANVCA to select the best choice for your Village Corporation. According to the bylaws Full Members pay dues within the recommended structure allowing them to vote at the Annual Meeting and making them eligible to hold office on ANVCA Board of Directors. Affiliate Members are non-dues paying members; they may attend and participate in events. This level of membership is suggested for Alaska Native Village Corporations whose annual revenues range between $20 and $50 million. This level of membership is suggested for Alaska Native Village Corporations whose annual revenues range between $5 and $20 Million. This level of membership is suggested for Alaska Native Village Corporations whose annual revenues range between $1 – $5 million. ANVCA Mount Kennedy Membership NEW! Become an ANVCA Partner Today! At ANVCA establishing long term Partnerships is essential. Partners are entities that have a similar mission or wish to actively support our mission of promoting Village Corporation success and protection of our Native lands. A Partner is committed to actively work towards the mission. Below are the four different levels of Partnership. ANVCA encourages participation be based on your corporation’s growth and income. ANVCA is a nonprofit and is heavily reliant on our business Partners. Individuals and businesses are both eligible to become Partners of ANVCA. Partners are invited to participate along side Members at ANVCA events. The moose is a critical Partner to ANVCA. We rely on large corporate partners for viability the organization. This level of Partnership is designed for committed Partners who value their relationships with Alaska Native Village Corporations or looking to build new relationships. Building moose level Partnerships will allow ANVCA to expand services and projects for the long term economic benefit of Alaska Native Village Corporations. The salmon is the Partner we depend on annually at ANCVA. This Partnership level designed for mid to large size Partners who can commit financially to ensure that ANVCA has the resources to maintain and improve services to Members and Partners. Salmon level Partnerships allow the organization to thrive. The caribou is a key player in the sustainability of ANVCA. These Partners include mid-size and local businesses or organizations who treasure contacts within ANVCA. Caribou level Partners are vital to projects and programming for Members and Partners. The ptarmigan is important to the organization and future of developing Alaska Native Village Corporations. This level Partnership is designed, in part, for those for small business owners and individuals who seek to Partner with ANVCA. Fill out the ANVCA Partner Agreement today! Thanks to all our 2017 Partners! 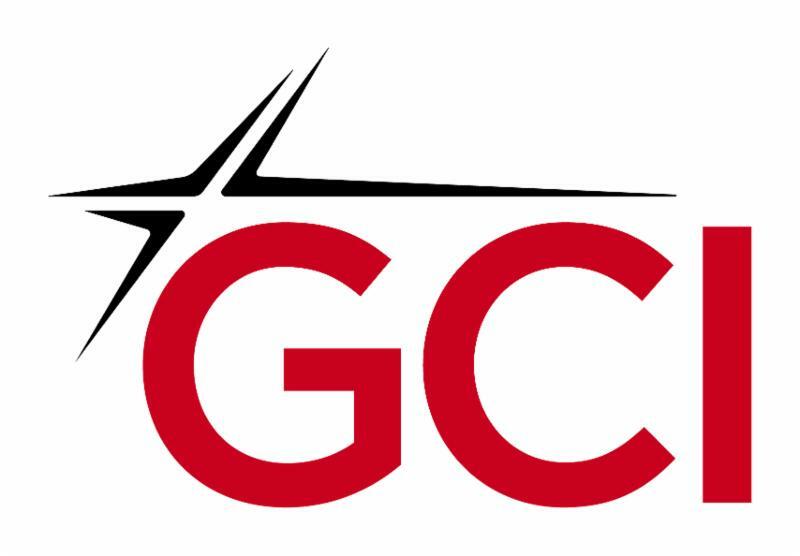 We are proud to be supported by GCI at the Moose level!